Pvt. Clarence A. Martin, son of Mr. and Mrs. John Martin, attended school in Grandfield; husband of the former Marcielle Nault. Entered Marines in April, 1944, trained in Camp Pendleton, Cal. 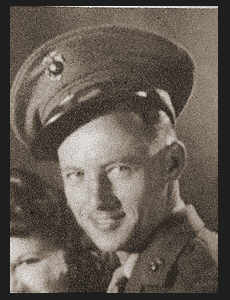 ; served in S. Pacific; was wounded in action in Feb., 1945 in Iwo Jima and was killed in Saipan in March, 1945. Awarded Good Conduct Medal.